Coffee grown in Kodagu, Chikkamagaluru and Bababudangiri will shortly get geographical indication (GI) tag, said Srivatsa Krishna, CEO and secretary, Coffee Board, on Monday. Speaking to reporters on the sidelines of ‘Naya Bharat: Coffee Par Soch,’ as part of International Coffee Day, he said that the Board had applied for GI tag for coffee grown in five southern regions, based on their uniqueness. Of these five places, three are from Karnataka. The list also comprises coffee grown in Araku valley (Andhra Pradesh) and Wayanad (Kerala). The GI tag is likely to come by January 2019. This is the first time that GI tag has been applied for coffee-growing regions. In 2008, GI tag was obtained for Monsoon Malabar coffee blend. “The idea of doing this is to recognise the coffee, promote the brand and increase local sales. Over 70% of India’s coffee is grown in Karnataka, but the market needs to be strengthened,” he said. To increase the production of coffee, regain the market position and encourage farmers, Mahatma Gandhi National Rural Employment Act funds will be helpful, Krishna said. “I request the Coffee Board to tie up with zilla panchayats to recoup and expanexpand the areas. Funds for coffee planters under MGNREGA will be given, on the lines of mulberry and sericulture,” he said. Krishna said the floods in Kodagu had an impact on coffee production, but things were improving. On the occasion, the Board announced the launch of Atal Incubation Centre at Coffee Board in Bengaluru. This centre will help startups and coffee growers to become entrepreneurs. The centre is set up under the Atal Innovation Mission (AIM) to nurture innovative startup businesses. 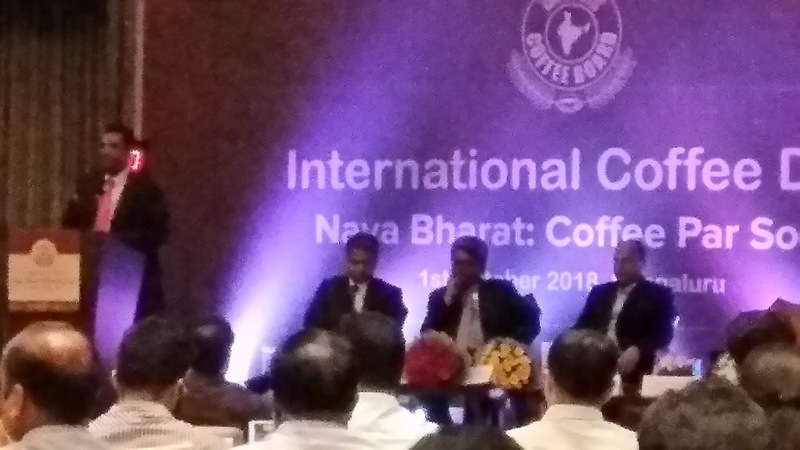 So far, in India, 20 centres have been established, Coffee Board is the 21st and the first such in India, said R Ramanan, mission director, AIM. This centre is being set up in partnership with Nasscom and FKCCI. The Coffee Board also announced its partnership with Ernst and Young for ‘The Future of Coffee-Roadmap’, and with National Institute of Public Finance and Policy for a study on subsidies for Coffee Industry.